Hey, what a surprisingly refreshing and fun, light, feel good film! Bubbly blonde Witherspoon enrolls in Harvard Law school in order to impress her fleeing lover. Leaving a wake of bewildered reaction shots, this pink-clad sorority gal is quick to point out that she'd aced all those fashion merchandising classes and even hired a Coppola to direct her admissions video. Though originally interested in winning back her senator-wannabe bo, Witherspoon learns a great deal at Harvard ... and Harvard learns a great deal from her. 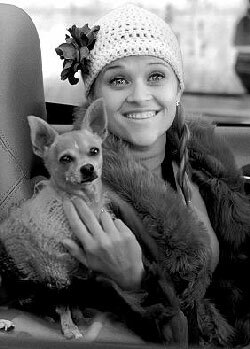 From her shivering Chihuahua, to her fur phone, to the pink, scented resumes, this is one woman with more class than Harvard Profs. Witherspoon explains her character, "Actually, maintaining that sort of bubbly energy all the time is hard work! Elle never takes a break from staying up! .. We decided to create Elle as a person who has a real, unbreakable innocence. She basically believes people are good and the world is good and that never changes throughout the movie. I really like that and I wanted to impart it in a big, colorful way. Of course, no normal person would wear these clothes in public, but it all makes sense in the context of Elle's character." Well directed and acted despite earlier "B" dialogue which promptly improves escalating the production into a delightful evening at the theater. I enjoyed this film! PS ... perfect title. Legally Blonde. Copyright © 2001. Rated PG-13. Starring Reese Witherspoon, Luke Wilson, Selma Blair, Matthew Davis, Victor Garber, Jennifer Coolidge, Holland Talor, Ali Larter, with Raquel Welch. Written by Karen McCullah Lutz & Kirsten Smith. Produced by Marc Platt, Ric Kidney at MGM.